New Year’s Resolutions are a long-held tradition. Folks make resolutions on a number of topics, such as losing weight, to stop smoking, to sleep more, to drink more water, to save money, to begin an exercise regimen, to be more organized or even to become a better person. But the fatal flaw in most New Year’s Resolutions is that folks are not setting realistic goals for themselves, thus biting off more than they can chew and not being able to attain success, only disappointment. The same pattern can happen in your Grange. Are you setting unrealistic goals for your Grange to achieve each year, only to be disappointed when they don’t happen? For example, is your Grange vowing to take in 10 new members, but then only takes in 6 new members, coming in short of the set goal? Instead of enjoying the addition of 6 new people to your Grange ranks, your members are concentrating on the 4 people that never materialized, bringing down the attitude of the other members who tried in the process, but did not succeed. Wouldn’t it be better to set a goal of 4 new members, and thus exceed that goal by taking in 6 new members, than having the above scenario happen? Setting your Grange goals and objectives, such as growing your membership and retaining existing members, offering more events, or taking on a new community service project are a perfect way to start off the new year. Remember that setting goals that are achievable is important in their successes. Effective communication between your Grange, your members and the public is key to obtaining your Grange goals. Look for ways that your Grange can leverage existing projects and activities to achieve set goals. Granges hold the keys to each of their futures. 2018 is a new year. Bolster your Grange’s successes by communicating clearly and effectively with your membership, with other Granges and organizations, and with the public. The CT State Grange Public Relations Committee is here to help. 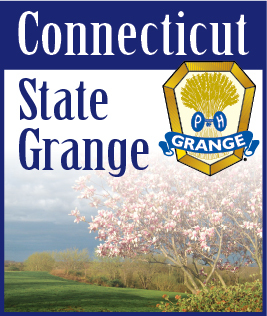 Contact Terri or Bob today at information@ctstategrange.org or publicrelations@ctstategrange.org .